If you have an ink system, you'll save a lot of money, you should know that ink per place the system, follow the steps below and discover that ink used to improve quality. Inkjet printers Canon FINE ink cartridges CL and PG, using the two types of ink jet, like printers from other manufacturers in the color ink cartridge CL- use water inks. And in the black ink cartridge PG used pigmented inks (based pigments), for strong colors and high quality required for printing small letters and maintain consistency. If you install a printer ink system, we recommend using the correct ink, if you want documented with the manufacturer's web page, the type of ink used by each cartridge. The pigmented ink gives better quality and durability, but we must not put this ink cartridge color, thus we will damage the ink cartridge easily and documents will not have color mixing sought. 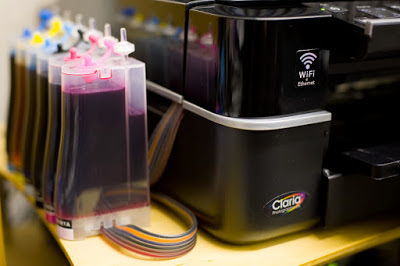 Do your best to get the right ink, but if you use the simple inks, such as water for all cartridges, this does not mean that the cartridge will not work or be damaged, only when a color requires more quality and intensity leads the black color, if the printer has a color correctly, means the corresponding print quality will be different. Do not be swayed by terms used by ink vendors to alter the price of their product, calling these "ink dye premium" is the says a person who knows the components of ink, the Canon printers really are not very demanding, or better said cartridges, if you want to always check that uses ink cartridge fence to the product description on the manufacturer's website. If you have questions, we're here to help leave your comment for anything, this will help improve our content feedback and improve the quality of our publications.